The carcass of the KED is made of a flexible material. Reinforced with wooden slats to prevent deformation once applied. 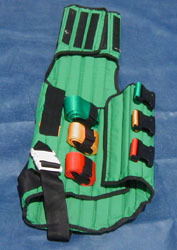 Has 3 straps, with corresponding buckles, that wrap around the torso to fix it in position. Has 2 straps that secure it at the groin. Has a malleable cushion to place behind the head. Has head and chin straps to secure the head within the device. Has carrying/lifting handles on both sides. Before the KED is applied, the crash helmet must be removed in the approved manner maintaining manual in-line stabilisation. If a HANS device is in use, the helmet must first be separated from the shoulder section. 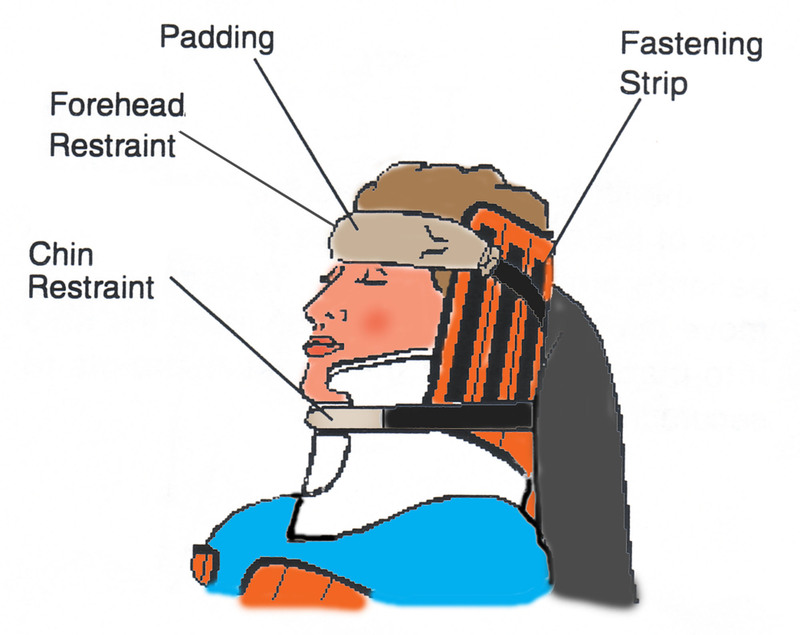 A properly fitting hard cervical collar must then be applied. If a HANS device is in use the shoulder section must first be removed. Manual in- line stabilisation of the cervical spine should be maintained throughout application of the KED even though a collar has been applied. If there is inadequate space for helmet removal or KED application, space must be created. This may necessitate removal of a roof or roll cage. It may be possible to lower the driver in the seat to allow helmet removal/KED application. Wings on seats severely hamper KED application and should be cut away if necessary. (A helmet saw is ideal for this task). Successful use of the KED requires teamwork and training. Each member of the team must be designated a specific tasks to be carried out in a specific order. Deciding how to create space if necessary and arranging the use of a rescue unit should any cutting be required. Monitoring/supervising the application of the KED and extrication of the casualty. Not to get directly involved in KED application unless absolutely necessary. Assist doctor with helmet removal and application of cervical collar. Maintain in-line manual stabilisation of cervical spine during KED application. Prepare equipment whilst helmet is being removed and cervical collar applied. Crew Members and under the supervision of the Team Leader. Crew Members and supervised by the Team Leader. 1) Slide KED between casualty and seat. This will require easing the casualty forward temporarily whilst maintaining cervical spine control. 3) Ease casualty back in the seat onto the KED. 5) Re-check and tighten all torso straps and groin straps. 6) Re-check and adjust head and chin straps if necessary. Secure limbs. 7) Lift casualty clear of wreckage, under the control of the Doctor, and onto a spine board or vac-mat as appropriate. 8) Loosen groin straps and lie the casualty horizontally as soon as possible. 9) Transfer casualty, on the spine board or vac-mat onto the ambulance cot and then into the rescue unit or ambulance. 10) If a long journey is expected, transfer the casualty from the long spine board onto a vac-mat using the bridge manoeuvre. Just because it can be trebled in thickness using the Velcro securing strap DOESN’T MEAN YOU HAVE TO DO IT! Must be applied on either side simultaneously - forehead strap first. Difficult to tighten sufficiently - "Saw" under buttocks to get in correct position. Must be secure and flat from side to side even if it is raked top to bottom.